Did I say weeds?? Yes I did. You see, on Saturday, Jeff helped me build 3 flower beds. This was my “Mother’s Day” gift. This was all I wanted. Working in my flower garden has always been wonderful therapy. And I need me some therapy. It’s true. You sweat…which gets out impurities in your body…and you (me) can spend countless hours on your knees weeding, not only unwanted growth from the garden, but unwanted growth from our lives. Unwanted growth. I have a lot of it. AND I NEED TO BE WEEDED! So, as I was getting an area “grass and weed free” and Jeff was off getting fill dirt for the raised flower bed, I began to talk to the Lord about my current ailment. It’s all about the heart. What my heart is feeling. Or not feeling. What my heart is longing for. And what His purpose is for my life. I began to see some areas that needed attention. As I lay my heart open before Him, He began to pull out the “unwanted growth”. Then He plants fresh seed. New growth. But it must be watered, tended and fertilized. So that is exactly what we did on Saturday. Then we watered. And I prayed. Now, you may think that is silly. But girls, I have ALWAYS prayed over my flowers, and my little plants and shrubs. I love it when I see the growth take root and flourish! HE loves it when He sees us take root and blossom for Him! I also did some container planting for my entrance and the patio. I will show you pictures of them later this week. This one picture is from last year’s container planting. I planted, prayed, watered and then one morning as I left the house, my plants at the door seemed to smile with gratitude! I smile with that same gratitude at the wonders and blessings that I see all around me—thankful that my Father “knows what things I have need of before I even ask”. And He sends. Have a blessed week! Take care of the weeds…before they take over the beauty of the garden in your life! This entry was posted on Sunday, May 18th, 2008 at 10:34 pm	and posted in Missions. You can follow any responses to this entry through the RSS 2.0 feed. « Do you know what a Weezie is? I pray over my plants for sure……. Lord knows they need prayer when living at my house…… I love your post and so understand the need for being “weeded”…. I have much that needs to be pulled up at the roots from my life……. I guess we will never be weed free until the trumpet sounds, but I would like to think that my weeds are getting less…… One would hope…… have a blessed week…….. Thanks for such a lovely post my friend. Praying that you will continue to take gentle, loving care of your hearts garden. I love you. What a beautiful post!!! I am praying for you my friend!!! Oh the lessons the Lord teaches us, when we take time to listen!! There are changes in our lives, too. Nothing like yours, but we are learning how to pick ourselves up and go on, because we KNOW the Father has more for us to do.Love to you, sweet friend!! Comparing us to growing plants is lovely. I need weeding and pruning and love!! And I get so much of that from Him who I love.Keep the preachin’ and examples coming, friend! Angie,Those are Georgeous! And I love the blue flowers and the red brick. 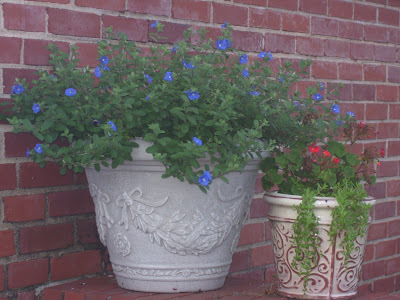 Our last house was my favorite and it was red brick…I love gardening too. But I love to gaze at the beauty even more:)I just have such a hard time getting going in the morning sometimes…devotions could go on all day if I let them. I just sit there and gaze and watch the birds at my feeder, the clouds in the sky and the trees and flowers in my yard….glorious beauty.